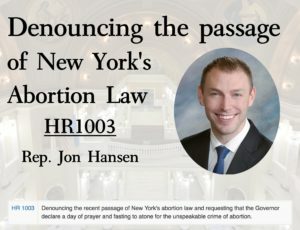 During the 2019 Legislative Session the SD House of Representatives adopted House Resolution 1003, which denounced the recent passage of New York’s abortion law and requested that Governor Noem declare a day of prayer and fasting to atone for the unspeakable crime of abortion. The Governor agreed, and has declared May 4th as a statewide day of prayer and fasting for all. In South Dakota and I respectfully request people of all creeds or none at all to observe this day with solemn mourning and pleas to heaven as best their consciences do direct. In Witness Whereof, I have hereunto set my hand and caused to be affixed the Great Seal of the state of South Dakota, in Pierre, the Capitol City, this First Day of April in the Year of Our Lord, Two Thousand and Nineteen. depravity they lit the One World Trade Center in pink! Women used to celebrate motherhood and find joy in their children. Today, in places like New York City, they are taking joy in destroying their children. The state of New York has crossed a line of inhumanity that should drive us to our knees. Forty-six years of the state-sanctioned killing of our most helpless and defenseless children should cause us to weep, to mourn, and to take action. What is to be thought of a society that kills her own children? What will the future be of such a heartless society that celebrates such barbaric inhumanity?